Gerardo Hernández addresses international solidarity conference in Havana, May 2. HAVANA — More than 1,000 delegates from 70 countries participated in this year’s international conference in solidarity with Cuba here May 2. The gathering called for stepping up worldwide actions to protest the continued U.S. economic, financial and commercial embargo of Cuba. Many delegates had joined in the million-strong International Workers Day march on May 1. A high point of the gathering was the closing remarks given by Gerardo Hernández, which are reprinted on page 7. 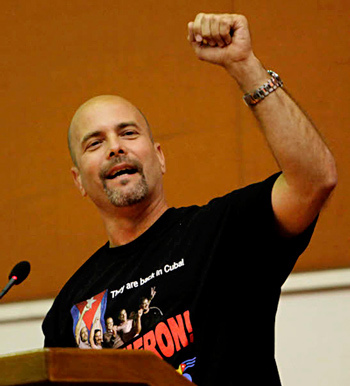 Ulises Guilarte, general secretary of the Central Organization of Cuban Workers (CTC), which sponsored the conference, thanked participants for their role in the worldwide campaign to win the freedom for the five Cuban revolutionaries — Hernández, Ramón Labañino, Antonio Guerrero, Fernando González and René González — who spent a decade and a half in U.S. prisons for their actions defending the Cuban Revolution. The delegates represented 205 trade unions, political parties and Cuba solidarity groups. A majority came from across Latin America; others were from the United States, Canada, European countries, and as far away as South Korea. There were 200 union delegates from Cuba. The purpose of this year’s gathering, larger than in previous years, was building on the victory won Dec. 17 with the return home of Hernández, Labañino, and Guerrero. They joined with Fernando González and René González, released earlier from U.S. custody after serving their entire sentences. All five participated in the conference. Cuban Deputy Foreign Minister Ana Teresita González Fraga told the audience that the beginning of Cuban-U.S. talks on re-establishing diplomatic relations — unilaterally broken off by Washington in 1961 — is a victory that registers the strength and dignity of the Cuban people and their revolutionary government. However, normalization of relations is not possible without the U.S. government ending its more than 50-year-long economic war against Cuba, she said, compensating Cuba for the economic and social damage it has caused, returning the territory it occupies at the Guantánamo naval base, and ending its subversive action programs aimed at Cuba, including its hostile radio and TV broadcasts. “It will be a difficult, complex and lengthy process,” González said, adding that Havana is engaging in these talks with full awareness of “the profound differences” between the two governments. Kenia Serrano, president of the Cuban Institute for Friendship with the Peoples (ICAP), called on the international delegates to continue to tell the truth about the Cuban Revolution — including its exemplary record in defense of human rights — and to “multiply your efforts in the struggle to end the economic, commercial, and financial blockade imposed by the U.S.” Serrano urged participants to build coordinated actions around the world Sept. 16-19 protesting the U.S. embargo. Some 30 delegates from unions, solidarity groups, political organizations and individuals took the floor during the discussion period. Afterward, Hernández, Labañino, Guerrero, Fernando González, and René González were awarded the CTC’s 75th anniversary medal for their outstanding contributions to the defense of the country. Each of the five, on behalf of the CTC and ICAP, presented certificates to nearly a dozen individuals representing trade unions, solidarity organizations and others in several countries whose contributions to the fight to free the Cuban Five deserved special recognition. End US embargo of Cuba!